I can't believe that I am posting in NeverSeconds for the third time in a row and still have two more to go! I was very excited to read all the comments on my post. Some one mistook me to be the small girl refusing veggies in my previous post, that was my junior! Today we had Navarathri celebrations here at our school. Navarathri is celebrated to worship the nine forms of the goddess Devi. 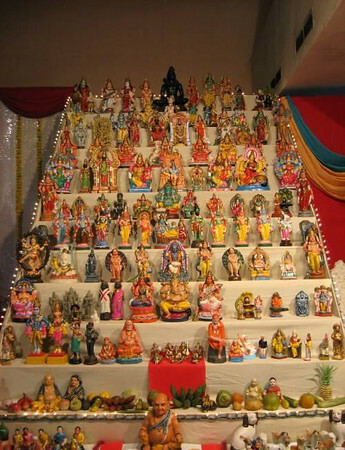 Synonymous with Navarathri is the Golu, an exhibition of dolls and figurines, which are always placed in an odd number of steps. Golus are customary here in Tamil Nadu, the state I live in. After a good lunch we had a Dandiya dance by all the students and teachers of our school as a part of the celebration. It was loads of fun! 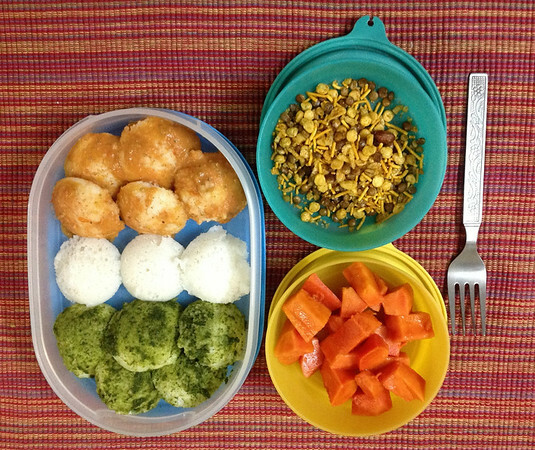 My lunch had a theme today - The Indian flag. The saffron in our flag represents Courage & sacrifice. The white stands for peace while the green colour stands for Prosperity. The blue wheel in the middle has 24 spokes exactly and represents Righteousness. For lunch, I had Idly or rather, 'mini' Idly, since the original Idly is about 4 times the size of these ones. Idly is a south-Indian dish eaten by most of the south-Indians daily. Idlies are made from a batter of rice and lentils. The green coloured ones you see were topped with coriander/cilantro chutney. The orange/saffron coloured idlies were topped with tomato chutney. My mom added garlic to change the colour of tomatoes from red to orange. The original idlies are the white ones in the middle. There should be a blue colour wheel in the middle according to the flag. Mom felt sorry for not being able to include that here. The fruit was papaya which was juicy and luscious, The snack was mixture, an Indian savoury. It was crispy, and tasted sweet and sour, as the name suggests, its a mixture of many savouries and is a real favourite of mine. Great post Harshi! Aside from the food, very informational about your culture and country. We had a big celebration that day..:D Ii knew that I would be really hungry that afternoon and also we usually share our food. Thank you. Harshi, again that looks a fine lunch and something I would be happy to try. Harshi, you lunch looks very tasty and I would happily try it, as long as it is not too hot/spicy - I am a real wuss when it comes to hot/spicy food. Thank you for sharing your lunch and culture with us again. Today's lunch looks delicious, Harshi! Thank you for sharing the pictures and information. I tried papaya once and I did not care for it. It's too bad because it looks so lovely!